The insurers also of course carry much sway in the index, and while on the back foot in recent months, I also wonder whether some analysts are getting bearish at the bottom, especially when you consider the likes of QBE. I read one analysts’ note yesterday who had a sell on QBE and wrote that it was ‘in the too hard basket.’ This sounds like capitulation to me. QBE has made a habit of coming out with unwelcome warnings in recent years, and therefore has lost a lot of market trust. This though has also meant a loss of perspective. A prime example was the reaction to the announcement of higher claim losses in the emerging markets division. The shares were sold down heavily, despite the fact that most other operations were performing well, and the EM unit is only around 10% of the group’s business. 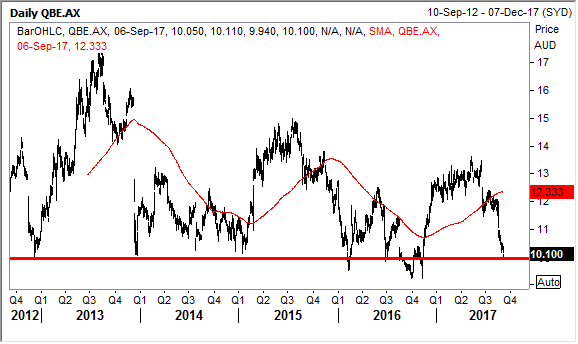 Technically, QBE is at an important crossroads, and $10 needs to hold. However, on a fundamental basis the stock has been significantly oversold, with the market not accounting for a cyclical upswing in premiums and interest rates. Nasdaq-listed shares of Wynn Resorts have surged to new two year highs over the past week, despite the geopolitical tensions roiling markets and the earlier landfall of Typhoon Halo in Macau in late August impacting the operations of Wynn Macau. As of the close of trading on Tuesday, the shares were up a whopping 55% over the past twelve months. Wynn Resorts is held in the Fat Prophets Global Contrarian Fund, along with the Global Opportunities and US Managed Account Portfolios. Through its majority stake in Wynn Macau, the parent has been riding the wave of a recovery in the world’s largest gambling market (Macau) over the past year. Wynn Resorts also has a couple of other growth projects in the pipeline in Las Vegas and Boston. We also have significant respect for founder Steve Wynn’s ability to create value for shareholders as he has proven a visionary in the industry and a savvy operator. Firstly, let’s briefly examine the state of play in Macau this year. Gambling revenue in Macau grew 20.4% year-on-year to approximately 22.68 billion (US$2.8 billion) patacas in August, marking the 13th consecutive month that gross gaming revenue (GGR) grew year-on-year, firmly snapping an earlier streak of more than two years of declines. The sum would certainly have been higher, but for some disruption caused during the month by the powerful Typhoon Halo that struck Macau on August 23. This led to some hotels and casinos temporarily suspending operations due to damage, power cuts and interrupted water supply. Still, the 20% growth rate was above downwardly the downwardly revised consensus estimate of 18% growth. Eight months through the year, the cumulative tally of gaming revenue in Macau year-to-date is 172.02 billion patacas, representing a year-to-date gain of 19.1% over the prior corresponding period of 2016. That is good for the broader industry, but particularly so for those operators that have newer properties that will attract the punters over more tired operations. Wynn Macau opened the $4 billion Wynn Palace in August 2016, setting a new bar for luxury. It is Wynn’s first property on the Cotai Strip and the second in Macau. The property has ramped up well, despite construction at other properties nearby causing some obstruction. In the second quarter of 2017, Wynn Resorts reported net revenues of $1.53 billion, up around $470.9 million, or 44.5% year-on-year. Wynn Palace was the key contributor to the gain, chipping in $414.7 million. It was a similar story at the EBITDA level, with group adjusted EBITDA of $430 million in 2Q17 marking a 37.5% or $117.3 million year-on-year increase. Wynn Palace was responsible for contributing $87.4 million of adjusted EBITDA. We are content with the ramp up of the Wynn Palace property to date and the strong price action in the shares indicate the broader market is too. Prior to its opening, we believed Wynn Palace would alleviate the company’s capacity constraint in the world’s biggest gambling mecca. We also believed that the gambling chill in Macau would thaw. This view looks to have been vindicated by numerous data points over the latter half of 2016 and early 2017, all indicating a better market backdrop in Macau. So, for Wynn, the timing of the opening of Wynn Palace looks good and our investment case remains intact. There is still plenty of scope for margins to improve, but that is to be expected and should play out as the property settles in and foot traffic increases in the future. The property still faces some impediment in the sense that it is still surrounded by construction. Bearing that in mind the performance has been solid and in the future, it could generate as much as $250 million in property EBITDA per quarter, or about treble what it contributed in 2Q17. Wynn Resorts also has a couple of expansion projects in the pipeline. 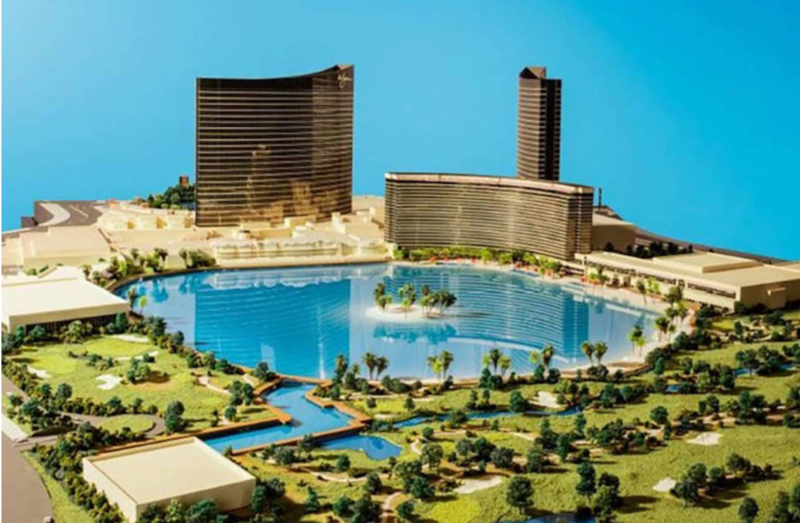 The first is the water-themed ‘Paradise Park,’ adjacent to the company’s existing casino resort in Las Vegas and will use the previously financially underutilised golf course property. The first phase will likely require investment of around $400 million to $500 million and take a year or so for construction. We see this as a low risk growth play for Wynn Resorts. Wynn is also building a casino resort in Boston. The company broke ground in July 2016 and believes it will be a three-year project. The budget is over $2 billion, so it is a substantial investment. We view this as a higher risk project because of the cost and that Boston is a relatively untested market for gambling. Mitigating the risk is Steve Wynn’s strong track record in picking industry trends and the affluence of the Boston area. All in all, Wynn Resorts has plenty of scope to grow in the years ahead. On that note though, I also wonder whether the US dollar is reaching a bottom, and especially considering the consensus is getting increasingly bearish. It is dangerous to catch a falling knife as they say, but it also had to land somewhere. 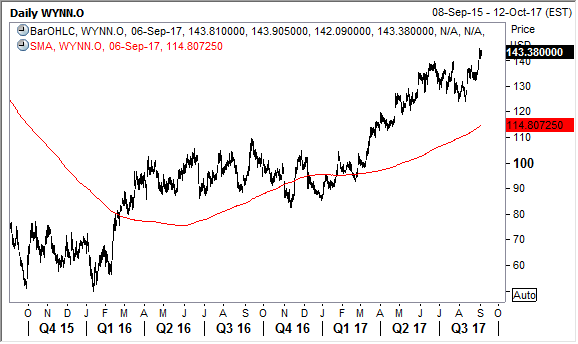 Banking group Nomura notably has forecast that the US dollar is now in a ‘multi-year downtrend.’ The currency experienced a 5-year uptrend from 2011 to 2016 but has weakened in recent months. Disclosure: The Fat Prophets Contrarian Fund declares a holding in Wynn Resorts, QBE, and Nomura.